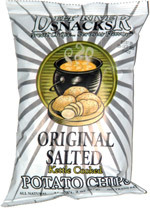 Taste test: These kettle-style chips were thick cut and very crunchy, but some of the chips lacked crispness. The crisp ones were good, with lots of salty potato taste, but the ones with that were less crisp were brought down a notch. Smell test: Good kettle-cooked chips smell, nice and potatoey.